Published: Aug. 24, 2018 at 11:03 p.m.
Detroit Lions running back Theo Riddick slices through the defense for a 10-yard touchdown run. 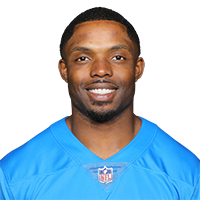 Published: Dec. 10, 2017 at 03:23 p.m.
Detroit Lions running back Theo Riddick evades defenders rushes for 18-yard touchdown. Published: Dec. 10, 2017 at 01:30 p.m.
Detroit Lions running back Theo Riddick bull rushes the Tampa Bay Buccaneers defense for 2-yard touchdown. Published: Dec. 3, 2017 at 03:02 p.m.
Detroit Lions quarterback Matthew Stafford throws to running back Theo Riddick who rushes for a 4-yard touchdown.